The American modernist Charles Sheeler (1883–1965) explored the relationships between photography, film, and more traditional media such as painting and drawing with more rigor and intellectual discipline than perhaps any other artist of his generation. As in a well-conceived scientific experiment, Sheeler used his own photographs and film stills as the basis for paintings and drawings, thus crystallizing the differences and similarities between them. Works in one medium manage to function as independent objects while also being inextricably linked to works in other media. During Sheeler's lifetime the essential role that photography played in his creative process was often criticized or obscured because the medium's legitimacy as an art form remained controversial. In 1931 Sheeler himself — wary of being accused of simply copying his photographs, and at the behest of his dealer, Edith Halpert — began downplaying their connections. Yet the complex dialogue Sheeler forged among various techniques early in the century is one of his most innovative and important contributions to the history of American modernism. Organized chronologically and covering the major themes of Sheeler's career, Charles Sheeler: Across Media allows viewers to compare works of the same subject rendered in a variety of media. At first glance some of these works may seem identical, but closer inspection reveals their subtle and meaningful differences. In presenting these relationships, the broader pattern of Sheeler's artistic enterprise — what he once called "the whole cloth from which my work has been cut"2 — emerges. 1. Quoted in Constance Rourke, Charles Sheeler, Artist in the American Tradition (New York, 1938), 119. 2. Charles Sheeler to Edith Halpert, June 9, 1956, Downtown Gallery Papers. Sheeler was trained at the School of Industrial Art in Philadelphia from 1900 to 1902. He then enrolled at the Pennsylvania Academy of the Fine Arts from 1903 to 1906, where he learned an impressionistic style under the tutelage of the painter William Merritt Chase. In early 1909, on a trip to Paris, he encountered the revolutionary works of Henri Matisse, Pablo Picasso, and other European modernists. Recognizing the break with the past that these artists represented, he returned to the United States determined to cast aside his previous conceptions of art and pursue a new direction in his work. Around 1910 Sheeler took up photography as a way to support his painting — first documenting buildings for local Philadelphia architects, and later photographing works of art for New York dealers. In 1913 he participated in the first comprehensive display of European and American modernism in the United States, the Armory Show in New York, where he admired the works of the iconoclastic French artist Marcel Duchamp. By 1917 Sheeler was being recognized not only for his cubist-inspired paintings and drawings but also for his innovative photographs. Alfred Stieglitz, the influential champion of modern art in America, proclaimed Sheeler, along with Morton Schamberg and Paul Strand, the "Trinity of Photography." The photographs that brought Sheeler to Stieglitz's attention were taken in the rural countryside of Bucks County, Pennsylvania. These included images of an eighteenth-century Quaker fieldstone house located on the outskirts of Doylestown, which Sheeler and Schamberg had begun renting around 1910 as a weekend retreat and painting studio. 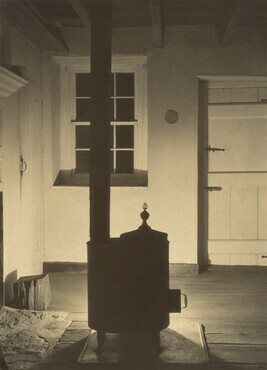 Doylestown House — The Stove of 1917 exemplifies the sharply focused, more objective style that was then being promoted by Stieglitz as an alternative to the painterly aesthetic and blurred effects favored by photographers earlier in the century. The Stove documents the encounter between a machine and an object — the camera and the stove — that seemingly occurs without human intervention. Yet this very lack of a distinct human presence invites viewers to project themselves into the photograph's empty spaces. The architectural construction of the work facilitates movement in and out of the picture, and the tactile qualities of the image's surfaces can be read as vestigial signs of human touch and craftsmanship. Sheeler conceived of The Stove as part of a series of twelve prints that allowed the viewer to experience the interior spaces of the house in myriad ways. 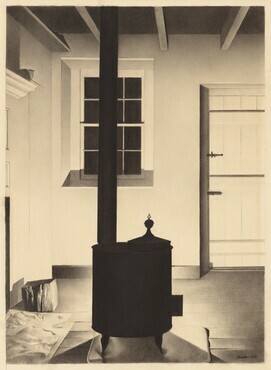 Moreover, he wrote to Stieglitz that he saw the Doylestown photographs as "more akin to drawings,"1 and they later served as the basis for large Conté crayon drawings such as Interior with Stove, 1932, and for paintings such as The Upstairs, 1938. Sheeler exercised ever greater aesthetic control over his subject in these related works, eliminating certain details and making subtle compositional changes to his already highly refined photographs. Art begat art as the interior of the Doylestown house was captured successively in photographs, drawings, and paintings. 1. Charles Sheeler to Alfred Stieglitz, November 22, 1917, Alfred Stieglitz/Georgia O’Keeffe Archive, Yale Collection of American Literature, Beinecke Rare Book and Manuscript Collection. (right) Skyscrapers, 1922, oil on canvas, The Phillips Collection, Washington, D.C. In late 1919 or early 1920, shortly after buying an expensive 35mm movie camera, Sheeler approached the photographer Paul Strand about developing a project together. From early 1920 into the fall of that year, they made a short film depicting a day in the life of New York City. Consisting of approximately sixty-five shots sequenced in a loose, narrative format, it begins with the Staten Island ferry approaching lower Manhattan to release hordes of morning commuters, and it ends with a sunset view taken from a downtown skyscraper. Shown in London in 1927 under the title Manhatta, the movie was lost for nearly a quarter century. It is now widely acknowledged as a landmark in the history of avant-garde cinema. In Manhatta Sheeler and Strand sought specifically to apply, as Strand wrote, "their special knowledge gained from experiments in still photography, to the motion picture. "1 Various scenes pay homage to the cityscape photography of their contemporaries, including Stieglitz. Camera movement is kept to a minimum and incidental motion is isolated within carefully arranged abstract compositions. Although Sheeler soon abandoned filmmaking, Manhatta had a lasting impact on his work in other media. When he filmed a section of the city around the Park Row Building in lower Manhattan, he also made a series of still photographs, surveying the same area in ways that mimicked the panning motion of his movie camera. He then used one of the photographs in the series, New York, Park Row Building, 1920, as the basis for a pencil drawing, New York, 1920. The drawing is in turn closely related to Skyscrapers, the painting of almost identical size that followed in 1922. Stills from the film also inspired other paintings and drawings. As a sequence of images viewed over time, film provided Sheeler with a flexible conceptual framework that he extended into other media; what begins as a movie becomes a photograph and ends as a drawing or painting. Revisiting favorite subjects over the course of his career, his series often span decades, with many years routinely separating works in one medium from those in another. 1. Press release, Museum of Modern Art, film department archives. In the Rouge commission and the related works in various media, Sheeler successfully navigated the boundaries between applied, commercial, and fine art. For the rest of his career he continued to depict American industry, until his name became virtually synonymous with the subject and with the crisp, geometric style associated with it: precisionism. While many other artists associated with precisionism — such as Georgia O'Keeffe, Charles Demuth, and Joseph Stella — explored industrial subjects, few could match the variety of approaches and techniques Sheeler brought to the task. 1. Interview by Bartlett Cowdrey, December 19, 1958, Archives of American Art, Smithsonian Institution. 2. "Sheeler 1946," Art News 45 (March 1946): 30 – 31. 3. Charles Sheeler Papers, Archives of American Art, Smithsonian Institution. Sheeler's ongoing practice of revisiting subjects in different media over the span of decades is encapsulated in the painting The Artist Looks at Nature, 1943. The scene at the lower right is based on a 1932 photograph, Self-Portrait at Easel, that depicts Sheeler in the process of making the large 1932 Conté crayon drawing Interior with Stove, which was in turn based on his 1917 photograph The Stove. Visual puzzles abound here. For instance, Sheeler's title states that the artist is looking at nature, but he is instead sketching a nighttime scene of a simple interior — not the immense landscape flooded with daylight that surrounds him. When the painting was exhibited in 1944, it was reported that the scene incorporated views of Sheeler's home in Ridgefield, Connecticut, and of Boulder Dam (now Hoover Dam). Such a fanciful blending of bucolic, domestic views with the monumental forms and spaces of a public dam would account for the odd, unstable relationships and discrepancies of scale between the figure of the seated artist at the bottom right, the red-roofed house in the upper left corner, and the moat between them framed by the steep walls and stairs. 1. Charles Sheeler Papers, Archives of American Art, Smithsonian Institution. By the 1940s photomontage was a fairly common technique in both commercial and fine-art photography. What distinguished Sheeler's use of the medium was that he employed it not as an end in itself but as a basis for works in other media. While these again included oil paintings and Conté crayon drawings, Sheeler also experimented with new materials and methods, such as smaller works on glass and tempera studies. The layering of various media that characterized Sheeler's earlier efforts culminated in the montage aesthetic found in his kaleidoscopic, carefully orchestrated series on the theme of the New England mill. In paintings such as New England Irrelevancies, which features an overlay of scenes from both the Andover and Manchester sites, Sheeler was able to merge abstract form and realistic detail in new, complex ways. 1. William Carlos Williams, "Postscript by a Poet," Art in America 42 (October 1954): 215. Overview: 50 paintings, photographs, works on paper, and a film by American modernist Charles Sheeler were presented in this exhibition, which explored the artist's practice of revisiting subjects using different media over the span of decades. The installation opened with examples of Sheeler's photographs of the interior of a Doylestown, Pennsylvania, farmhouse, which later served as the basis for Conté crayon drawings and paintings. A 10-minute DVD transfer of a vintage print of the 1920 film, Manhatta, which Sheeler made in collaboration with Paul Strand, was shown with Sheeler's related paintings and drawings. His photographs of the Ford Motor Company River Rouge plant were shown in the second room of the exhibition with later paintings and drawings of the same subject. Montages on the theme of the New England mill also were on view. A public symposium was held on June 11 in the East Building Auditorium, followed by a screening of the 1920 film Manhatta, with an original score by Donald Sosin performed by the composer. Several other short city films also were presented. The film performance was provided by the film preservation project Unseen Cinema: Early American Avant-Garde Film 1893–1941, sponsored by Anthology Film Archives, New York, and Deutsches Filmmuseum, Frankfurt am Main, and underwritten by Cineric, Inc.
Organization: The exhibition was organized by the National Gallery of Art. Charles Brock, assistant curator of American and British paintings, was exhibition curator. Sponsor: The project was made possible by Altria Group, Inc. Catalog: Charles Sheeler: Across Media, by Charles Brock. Washington, D.C.: National Gallery of Art, 2006. Brochure: Charles Sheeler: Across Media, by Charles Brock. Washington, D.C.: National Gallery of Art, 2006.